For any questions not answered below, please get in touch. Why choose a serviced office at Fetcham Park? Our offices put designer style and attention to detail in the historic surroundings of a Grade II* listed building. So you get flexible office space with no capital and no commitment - but plenty of character. What does an office include? Our offices include everything from your IT and telephony to iconic furnishings from established pioneers like Hermann Miller. We ask for two months fees as a deposit, which is returned at the end of the term. What extras will I need to pay for? Your consumables, such as the calls you make and the photocopying you do, all of which will appear on a convenient itemised bill every month. You’ll have access codes to the building and your office and can lock your own office whenever you need to. Yes - and there are plenty of spare spaces for your visitors too. You’ll have your own keys, so yes, come in at weekends. Or early in the morning. Or in the middle of the night. You have access 24 hours a day, seven days a week. Once you’ve signed up and we’ve received your deposit, you can start immediately. Why choose a virtual office at Fetcham Park? Our virtual offices give you the advantage of our prestigious address and location, without the cost of physical space. So you continue to work on the move or from another office, while using Fetcham Park as a point of contact for your customers. What does a virtual office include? Our virtual offices can include the use of our address and a dedicated telephone number on your stationery, as well as mail handling and telephone answering. We invite you to pick a package with the combination of services you require. Can I use other facilities at Fetcham Park? Yes – hold your next meeting here and we’ll make sure you have our best possible rates. Once you’ve placed your order, we can have your virtual office ready to go within 48 hours. What is the minimum term for a virtual office? Virtual office orders are for a minimum of three months, although our 12 month packages offer preferential pricing. What if I want to upgrade to a serviced office? Easy. Just let us know and we’ll transition you into an office space to suit your needs. You won’t even need to change your stationery. Why hold an event at Fetcham Park? 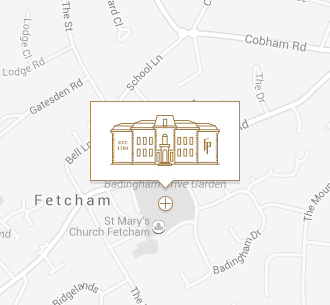 Fetcham Park is a luxurious location that turns meetings and events into exciting occasions and it’s practical, too – just a short drive from Leatherhead and the M25. Can you help me plan my meeting or event? Absolutely –give us a call and we’ll put our experienced event management team to work. Can I change the layout of my meeting room? We’ll get your meeting room set up to suit your meeting, whether you need a classroom layout designed for learning or a boardroom to facilitate decisions. Let us know what you need. Can you provide catering for my meeting or event? You’ll get unlimited refreshments as part of your meeting or event, but we can also help with more extensive catering. Contact us to see our menus and find out more. What is the maximum capacity for meetings and events? We can provide a meeting room at Fetcham Park for as few as two people, or the entire ground floor of the building for up to 150 of you. What is the minimum hire period for a meeting or event? Our meeting rooms are available from as little as half a day and for existing Fetcham Park office clients, we can provide meeting space from as little as an hour.